Dimensions: 5.1" x 8.6" x 11.8"
Just as beauty is in the eye of the beholder, perfectly brewed espresso is a matter of taste. 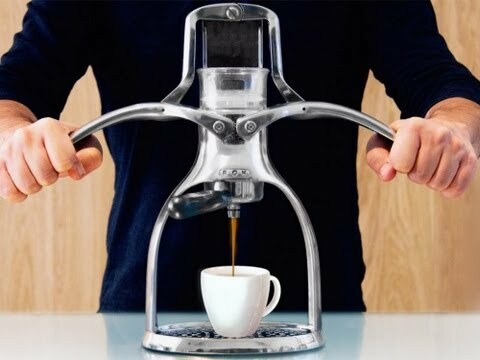 From a British company called Rok comes a non-electric espresso maker that puts the power completely in your hands so you can make each cup just the way you like it. While steam-powered espresso makers have been around since the turn of the 20th century, the Rok Espresso Maker is a hand-pumped machine. Not a single volt of electricity necessary (no pricey coffee pods either). The sleek engine grade metal and elegant shape make a statement on the countertop and bring new joy to a cherished part of any coffee connoisseur's day. For best results, be sure to use finely ground espresso beans and boiling hot water. By changing the amount of pressure you apply to the handles, you can control the strength of the espresso you make. The slower and steadier you press, the stronger the taste. 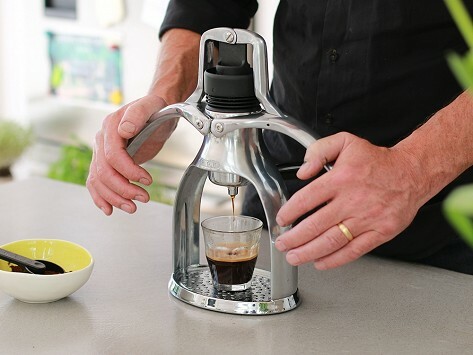 The Rok Espresso Maker comes with a 10 year guarantee and is packaged in a reusable tin that includes a measuring spoon, detachable double spout, and a stainless steel milk frother. Why go to the coffee shop when the art of making espresso is right within your reach.